I have found a gold forecaster with a 100% accuracy rate. Below is a chart of two of his recent predictions. The first arrow marks the 15th of January when he said to "use narratives, not just charts, to tell if gold's bottom may be near", noting that mainstream commentary was a "precursor to more bullish narratives. It also gives confidence to smart money to start to get into the market"
The second arrow marks the 15th of March when he said that he "would not be surprised to see it correct down" and that "there will be corrections on the climb back up" during the rest of 2014. Of course the forecaster is me, and the 100% accuracy rate is misleading as I've only made these two calls in the entire time I've blogged (here and here), but hey, since when does the full truth matter in click baiting headlines? Now given that my sample size is only two forecasts, you can probably bet against my next call as there is no way I can maintain a 100% accuracy rate. I'm not ready to make a call for a bottom in this correction so at this time will just expand on the March 15 comments I made in an interview with Al Korelin. In that interview I noted negative premiums on the SGE were possibly indicative of bullion banks having overestimated Chinese New Year demand (BBs stockpile ahead of these high demand periods, see here for some evidence of this). Perth Mint has seen some on and off weakness in kilobar premiums recently and this was confirmed by Ed Steer noting that JP Morgan received exactly 160,750.000oz of eligible gold into their Comex warehouse on March 20. This is exactly 5 tonnes, which readers of this blog know is indicative of kilobars. If the Chinese are so hot for gold right now, why is JPM putting kilobars into a NY warehouse? "we see potential for a meaningful decline in gold prices towards the level implied by 10-year TIPS yields, which our rates strategists expect to rise further this year, and reiterate our year-end $US1,050/toz gold price forecast. More broadly, we believe that with tapering of the Fed’s QE, US economic releases are back to being a key driving force behind gold prices"
"Gold is going to be somewhat problematic from an investment standpoint over the next six to 12 months. 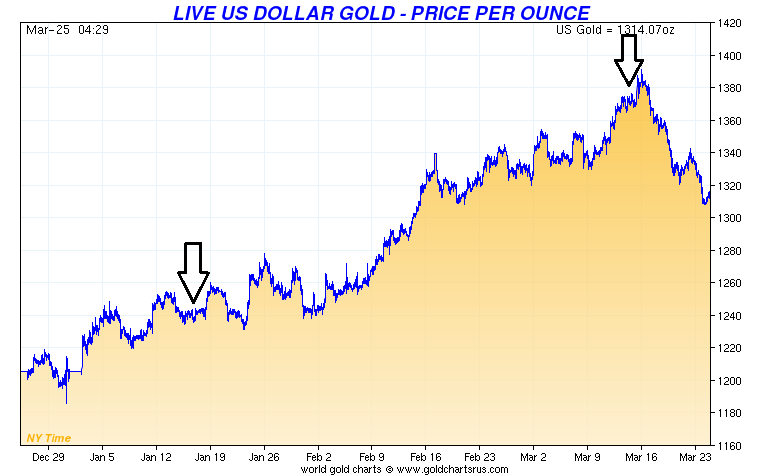 We’re probably looking to a relatively higher and quicker increase on rates, which is a headwind for precious metals." "We continue to believe that the economic momentum in the US shows further improvement, we reiterate our very bearish outlook for this year. Prices could drop below $US1,000. I would not rule that out." The important thing is these people believe this stuff, that the US is "improving" and they will trade gold accordingly. I think it is also worth noting Dan Norcini's repeated comments that this price run up was more about short covering than new longs, and he is representative of the Comex floor "narrative". I also note the Zero Hedge article on China Commodity Funding Deals regarding gold, which has some potential to be negative for gold, despite what some may say. Most likely their "don't worry, it is bullish for gold" interpretation comes from a lack of understanding of the deals as they probably haven't got access to the professional market commentary on that topic. That is for another post, but I will note I brought this issue to your attention in September 2012 and ZH and others who are now jumping on it could have found out a lot earlier from these articles (good background reading if you're keen) June 2013, August 2013, September 2013, December 2013 and finally from Koos Jansen, who you'd think gold bloggers would read, with this quote indicating the risk: "some enterprises in China use gold leasing from banks to solve their short-term funding problems in the hope of buying back the gold at lower levels to repay the lease. However they can be short-squeezed when gold moves higher"
So at this stage I think the risk is to the downside but will hold off on a bottom call until I can see some shift in the mainstream narrative. Warren has a cool animation showing the addition and redemption of pallets of gold bars out of GLD's vault, done in the style of the old PC disk defrag programs, at the screwtapefiles blog. During the redemptions in 2013, most of the bars are taken from the bottom, that is, the recently added stuff. Makes sense, this stuff is easier to access. But note much of the redemptions are from all over the place. Some of that is explained by them "hunting" for 9999 bars as Warren discussed in emails. He will have a follow up post taking this animation analysis into more detail showing this. In the pic below the area just above the empty bottom area is really stubborn, something about those bars they don't redeem from, even though they are more recently added than the bars in the first half of the pic above that section. Have a post up on the corporate blog How ETFs Haven't Altered The Dynamics Of Gold where I have a go at the mainstream finanical narrative that gold ETFs were a “game changer for the gold industry”, making it easier for investors to buy gold and having a positive impact on the gold price. If you properly classify bar/coin and jewellery bought for investment reasons then that accounts for over 11,400 tonnes of physical gold compared to only 2,600 tonnes of ETF investment between 2004 and 2012. More at the link. This Trust seems to follow the standard format, a trust backed by allocated physical 400oz bars. JP Morgan will be custodian. The differentiating factor in this trust will be that it holds other types of gold in addition to 400oz bars, such as smaller bars and even coins, and small investors will be able (if they want) to redeem shares for gold bullion, which is a new angle. There is a web site which seems to be on hold www.merkgold.com until after the IPO. See link for one of the filings. I'm surprised anyone would think more gold ETFs are needed, but maybe they think the redeemability in small sizes will be attractive. I would note that redeemability at any size into any coin or bar was a feature of Perth Mint's ASX listed gold product PMGOLD when launched in 2003. Ten years later they are catching up. The holding of smaller bars will just add to costs, but as they don't have a Mint out the back, I suppose there is no other way for them to offer than redeemability. Merk has some good articles on gold here, quote: "I am an optimist. I’m no conspiracist. I just happen to think the road to hell is paved with good intentions. As a result, I own gold". "While there is a place for ETFs in any investment portfolio, there are several drawbacks that do not make them the first choice for individuals wishing to invest in gold. When the goal is to simply benefit from a rise or fall of the price of gold, COMEX Gold futures are the logical choice. COMEX Gold futures offer the investor a fast and accurate pricing mechanism, the ability to leverage their trading strategies and the security of doing business on an exchange that has guaranteed the performance of each of its transactions for over 100 years." Sprott PHYS fund redemptions show up in the first few days of a month, and for March there were no redemptions. This lack of news is actually news as it confirms for me that the redemptions we have seen in the past (see here) were driven by an arbitrage opportunity. Below is a graph that demonstrates this. First I took the reported premium/discount to Net Asset Value (NAV) and subtracted the $5 per ounce redemption cost. 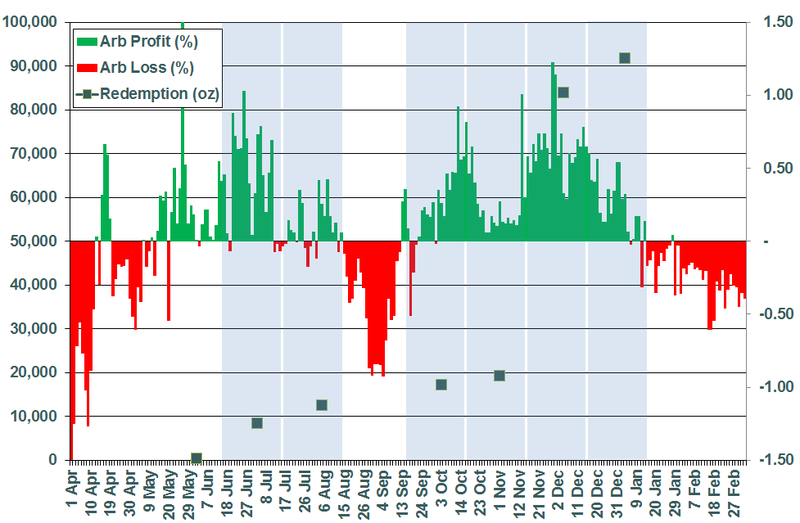 This is graphed in green (for a profit) and red (for a loss) in percentage terms on the right hand scale. When it is green, you can make a profit buying PHYS shares at a discount to NAV, redeeming, and then selling the physical gold at the higher spot market price. Second, I graphed the amount redeemed on the left hand scale and shaded the months during which the shares would have been accumulated to do the redemption. You'll note that the shaded periods run from the 16th of a month to the 15th of the next month. This is because you have to submit your redemption request to the fund by the 15th of each month to give the fund 2 weeks to process and get your gold ready for delivery by the end of the month. You can see from the chart that the redemption accumulations only occur when there is an arbitrage profit to be had and cease when there is no profit. PHYS first started to go into discount during April 2013 (prior to that it had always traded at a premium). However, while there was some arbitrage profit in May/June, that month only showed a redemption for 400oz. I think this is explained by the fact that PHYS was only showing small discounts to NAV and a trader or bullion bank first wanted to test the redemption process before redeeming in bulk. Hence they redeemed exactly one LBMA bar - not coincidental I think and strongly suggestive of a test transaction. As the discount persists into the Jun/July and July/August periods we see the trader ramp up the redemption quantities. I note that as a percentage of PHYS' trading volume for those months, the units redeemed were only 0.6% and 1.6% respectively. That is quite low. August/September presented no arbitrage opportunity so we don't see any redemptions. But in September/October and subsequent periods, the discount (and arbitrage profit) reappears and we see the redemptions increase. Note that while the next two redemptions are similar in ounces to Jun/July and July/August periods, due to lower trading in PHYS they represented 12.1% and 16.5% of trading volume respectively. This is getting quite high but the buying of PHYS did not drive PHYS back into a premium, so in the next two months the traders must have felt more confident and really ramped up their buying to the 3 tonne level, and at 28.9% and 30.1% of PHYS' trading volume in November/December and December/January respectively. I am wary of ascribing causality here, but do wonder if this high level of buying relative to the number of shares of PHYS that normally trade did result in the fund returning back into a premium to NAV from January onwards. That is what arbitrage in theory should do. I would note that the redemption activity we see may not be an arbitrage trade (that is, someone just looking to pocket the different in prices) but also a physical investor who is not interested in holding a fund and just sees PHYS as offering a cheaper way of getting physical. In either case the result is the same. I'll keep track of this data and post if there is any action that further confirms, or contradicts, the theory that a trader or investor is opportunistically taking advantage of PHYS trading at a discount to NAV. Similar percentages to the one by number of bars. As Golden Nugget commented, I should note that the spreadsheet is only for US Mint held gold, which is 95% of the total, with the other 5% held at the US Fed. Unfortunately the bar list for that is only supplied as a pdf of a scan so impossible to analyse in Excel. Anyone interested in the reality of the US gold reserves really should read the pdf of hearing 112-41 (see link) as this bascially busts many of the memes around the US gold reserves. I will do a post on that hearing as there is a lot of detail supplied and suprising that I've never seen much commentary around it. "Have already perused the bar numbers - a stack of Rand/Matthey/Rothschild bars there but no match (obviously) for the bar signatures we have in ETF data and happy to say that the sequences are consistent with the data we have. They are (again as you might expect) really old bar sequence numbers. Talking, early Rand number sequences. I gave them both the observation that the spreadsheet seems to have been built up from some older documents - there seem to be some OCR errors, which I assume were from earlier typewritten lists." 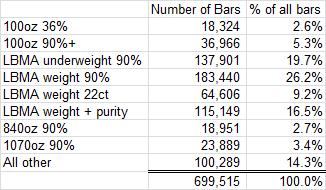 So 8 bar types account for 85% of the bars. No suprise that few meet the LBMA standards for weight and purity, given the source (1930s confiscation, ie coin melt) of most of the gold. Not suprised to see 100oz bars given that is Comex futures standard, but the 36% is not standard and clearly coin melt source. Significant is the fact that 55% of all the bars are 90% (+/- .1%) purity and 13% are 22ct (current US Eagle purity). Unusual is the circa 840oz and 1070oz bar sizes, very heavy. Note that the LBMA standards are post 1987, hence the bars which are close to LBMA weight and/or under purity are reflective of a general industry standard to 90%+ purity circa 350oz size bars prior to 1987, but this was later firmed up later by the LBMA to the currently 350oz-430oz 99.5%+ standard. I think that the sub 2 percent purity cateory is an error. 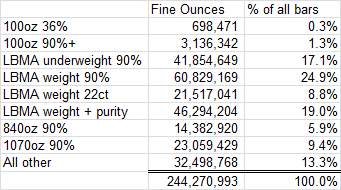 There are 714,993oz of gross weight recorded for this category and if we assume the purity is more likely around 90%, then this spreadsheet understates US gold reserves by 640,000oz! A lot more to come from this data but just wanted to draw attention to this data ASAP and look forward to further analysis and comment by Warren and others.